*We are not currently growing this item, but feel free to peruse the information. 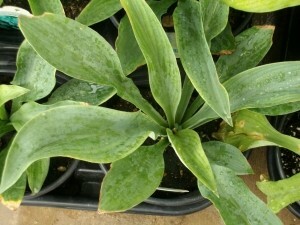 Description: Krossa Regal Hostas have dark blue-green leaves that are rounded with a wavy texture. Lavender blooms can shoot up as tall as 40″. Hostas are extremely popular, hardy herbaceous perennials grown primarily for their beautiful foliage. They are easy to grow, shade-tolerant plants. Leaves come in a wide range of shapes, colors, sizes, and textures and may be solid in color or variegated in different combinations of blue, green, white, and gold. The plants are low maintenance. Hostas originally came from Japan, China, and Korea. They were first introduced to Europe in the late 1700s and then came to the United States in the middle 1800s. Outstanding Features: Slug resistant. Attracts hummingbirds.